Powerful and crushing everything start goes to a conversation, narratin' to all around about deeds in the past. Breaking and ragged start of Animalevolence, not resultin' to the same rhythm with the vocal entry, continued by fast and powerful chopping drive. Melodic beginning with clean vocals in title Sinisterra, it is followed by a fairly rhythmic music with still clean vocals. Somethin' like harsh or growl joins after the guitar solo. Soular Eclipse - from the first sounds - pent-up anger growls, later sounds calms down briefly to prefer the melody with mighty support! An impressive gait Neptune servants paced all the world. Listen to their words in Oceanic Empires with their clear voices in this ballad until growl drive and strong blows of drums! The Purifire to clear from sins? What's the sin - if for ones creatures that's a sin, that's - accolade ?! For others - vice versa! Even so then at this composition - turned upside down, and - on the contrary. 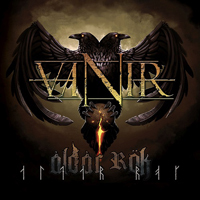 Black Legion begins by their march the pace of Vanir - Aldar Rok the pulsating rhythm, with stunning keyboard prepares you for the continuation of the story. In the Pretorian guitar steps forward bewitching keyboards and evil narrator. And all this has combined in a magical image of charming sound! Starts Unrepentant the bass solo, when the guitar and ringing bells repeats it, then an unhurried story told by the singer. Starts with hammering voice that want to smash up those who don't want to hear his words about Broken Throne, than a little break... than that voice wants to smash'n'crush all around again! Powerful stepping beginning of the Wrath Of Sutr, then accelerating by drums not for a while. Evil, intrepid The Serpent seamlessly follows on its way, destroying interference wit a flat and powerful rhythm. Elven or ancient Celtic motifs bears Drukvisen in its music. No one can be dead - when their music sounds everywhere!